I have always been attracted to the type of women you don’t bring home to Mom. In high school, those were the girls who smoked cigarettes, drank beer, and dated college guys. With a hint of danger and its classic curves, the Triumph Thruxton has always elicited the same effect on me as those bad girls of my youth. The Triumph Thruxton is not the fastest bike out there, or the lightest, or the most technical, but damned if it’s not one of the coolest. With styling cues and lines cut straight from the 1970s, the Thruxton helped usher in a resurgence of the café racer in America. 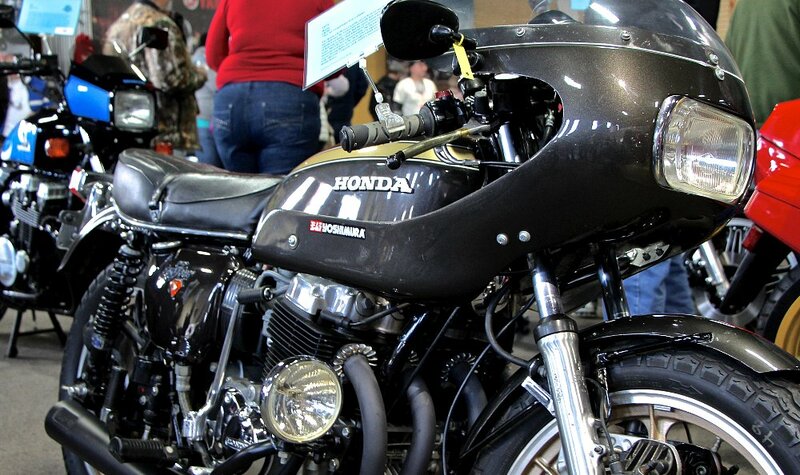 Or perhaps the resurgence of the café racer helped propel Thruxton sales. It’s the age-old “chicken or the egg” dilemma. The Thruxton’s engine, an air-cooled, DOHC, 865 cc parallel twin, remains relatively untouched over its 11-year run. Putting out 69 horsepower at 7,400 rpm and 51 foot-pounds of torque at 5,800 rpm, the Thruxton isn’t winning any races (except when raced against other Thruxtons in the series which bears its name), but power delivery is linear and predictable. The price comes in just shy of five figures with the MSRP at $9,799 for 2015. What looks like carburetors feeding the engine are actually fuel injectors. Photo by Ryan Shultz. The biggest updates to the Thruxton came in 2009 when Triumph swapped the Keihin carburetors for fuel injectors. To keep the classic look, the injectors were actually built into carburetor-styled bodies that can fool even the trained eye of Lemmy, our resident carburetor expert. With the addition of a one-inch handlebar setup, Triumph incorporated the T-100's controls and grips on the Thruxton. Photo by Ryan Schultz. The same year, Triumph swapped out the Thruxton’s clip-ons for a more comfortable handlebar setup incorporating the same grips and controls found on Triumph’s T-100 model. The Thruxton sets itself apart from other bikes in Triumph’s Modern Classic lineup with adjustable preload on the 41 mm front Kayaba fork as well as on the rear Kayaba shocks. The Thruxton’s 18-inch front wheel helps to give it a classic look while simultaneously making it extremely difficult to find a wide selection of replacement rubber. The rear wheel features a 17-inch rim wearing a 130/80-17 tire, making it a bit more common than the front’s 100/90-18 tire, but not by much. Stopping power comes from a single, dual-piston Nissin caliper up front as well as the rear, both clamping down on a single 320 mm and 255 mm rotor, respectively. What does that mean for you? It means that while stopping power is improved over your favorite “wish and a prayer” brakes found on that old vintage machine you’ve been riding around, you should still be prepared to give a hearty tug to bring all 500-plus pounds of British steel to a halt. Dual-piston Nissin calipers at the front and the rear of the bike provide stopping power. Photo by Ryan Schultz. At six feet, three inches tall, with a 34-inch inseam, I find myself in the less common position of looking for taller bikes, while most riders I talk to are concerned about bikes being too tall. 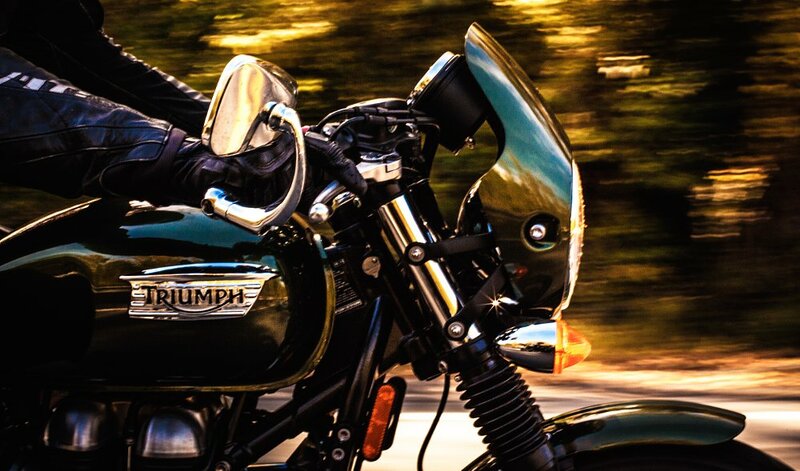 In Triumph’s Modern Classic lineup, the Thruxton is second only to the Scrambler in seat height. Coming in at 32.3 inches, the height is fine for me, but may be a bit prohibitive to some shorter riders. When I got the keys to the Thruxton, I immediately headed out to the low-slung hills of the Appalachian Mountains of eastern Pennsylvania. While living in Southern California and Tennessee, I rode bikes of all shapes and sizes down some of the best roads America has to offer, yet eastern Pennsylvania still holds a special place in my heart. It was here I first learned to ride a motorcycle, a Triumph Bonneville T-100 not so different from this Thruxton. Eastern Pennsylvania holds some of my favorite roads hidden in her hills. Photo by Spurgeon Dunbar. Around the city, the bike feels a bit clunky and misguided, almost as if it is unsure of its footing trying to navigate the potholes plaguing the streets of Philly. The fastest way out of RevZilla’s Philadelphia headquarters en route to my favorite country hot spots is to hop on the Pennsylvania Turnpike and super-slab it for about 30 miles. While the Thruxton will “do the ton,” it feels more at home cruising around 75 mph on the open road. Watching as the city skyline is replaced by towering trees covering rolling hills, I pulled off the highway, clicked it down a few gears, and tore off down an ancient, two-lane byway. I could almost feel the bike smile approvingly. The Thruxton feels perfectly at home winding down the back country roads of my youth. The long sweeping curves with predictable lines match nicely with the Thruxton’s comfort zone. While I know plenty of guys who use their Thruxtons for commuting and bopping around town, this is what this machine was made for: The Thruxton serves as a stylish getaway vehicle from the bustle of the city. Eastern Pennsylvania's hidden roads: you just need to know where to look. Photo by Spurgeon Dunbar. While this bike is no means a sport-tourer, one could easily throw over a set of soft saddlebags, add a tank bag and hit the road. I would have no problem cranking out 300 miles a day rolling down the blacktop with this bike. This is assuming we are avoiding the highway and just burning up backroads. To be fair, almost any trip on a motorcycle is more fun when avoiding the the highway. The engine feels strong and solid, pulling hard from 4,000 rpm on up. The linear power curve is one of my favorite features of this parallel twin. New riders can lug the engine down low without feeling overpowered while veteran riders can twist their wrists and take a run for the redline, with power tapering off shortly before hitting the 8,500 rpm rev limiter. The fly screen looks cool, but doesn't offer much in the way of true wind protection. Photo by Ryan Schultz. The fly screen around the headlight is more decorative than functional and by the time the fuel light came on around the 120-mile mark, I was ready to pull over and stretch. Fuel stops on the Thruxton are a blast if you are the loquacious type. At almost every gas stop, someone walks up to me and asks about the bike. From old-time riders who talk about the Triumphs of their youth to young riders aboard worn-out Hondas, staring with lustful eyes, there is no shortage of conversation surrounding this bike. I smiled right back, enjoying pushing the Thruxton through the corners. Photo by Brett Walling. Style. Classic lines. There is an old Elton John song about having “John Wayne stances and Errol Flynn advances,” a perfect reference to classic Hollywood. The Thruxton is classic Hollywood. This is the bike you buy as a daily runner if you love the look of that vintage Velocette or BSA in your garage but it doesn’t always get you where you are going. The Thruxton will get you there and look good doing it. Compared to the true vintage bikes it emulates, the modern Thruxton will cost less than one that's immaculately restored and force you to wrench less than would a typical older British bike. Hamming it up. Photo by Brett Walling. This is due in a large part to the overall dependability of the bike. Perfect for the rider who wants vintage styling but without the hassle that comes with owning a vintage machine. Oil changes are spread out over 6,000 miles with valve adjustments every 12,000, and there are no pesky points to adjust. Fast idle switch out, hit the starter and go. Despite the aggressive café style, the Thruxton's riding position is actually quite comfortable. I averaged about 250 miles a day and never felt cramped. My wrists were a bit sore towards the end of the day, but the handlebars are a huge improvement over the old clip-ons. The Thruxton is not a motorcycle anyone is going to buy based on a spec sheet. You can buy a lot more performance for the same money or a little better performance for less money. Aside from the weight (at 506 pounds, this is a heavy bike), most of the Thruxton's shortcomings are simple and can be easily remedied with the help of the huge number of aftermarket offerings. Start with the suspension. While the Thruxton has preload adjustment at both the front and rear, the overall quality of the factory setup leaves something to be desired. Rebuilding the front suspension with a progressively wound spring and medium-weight oil and swapping out the rear shocks should be top on your list of changes to make if you want to start pushing the performance of this Triumph. Even with the preload adjusted to match my weight, the Thruxton could use some suspension upgrades. Photo by Ryan Schultz. If performance is the name of your game, the stock Metzeler Lasertec tires have got to go. They feel rather numb and unstable as you become more liberal with your right hand. One of the downsides to the Thruxton is that you have a limited selection of tires to choose from in the stock size. On the plus side, if you are primarily commuting, the Lasertecs' harder compound offers excellent mileage, averaging about 10,000 miles from a rear tire. While I am a fan of the Thruxton’s 865cc engine, it is choked for fuel in the stock form. I haven’t ridden a stock setup in so many years that I forgot how badly these bikes are leaned out. A reflash of the ECU is something that you could do even if you don’t swap out the exhaust right away. But since you brought it up, you are going to want to swap out those pipes to give some bark to the Thruxton’s bite. From there on out, your possibilities for customization are endless. These bikes beg to be tinkered with. Consider it a blank slate from which you shall carve your masterpiece. Defining the Thruxton's competition is more difficult than usual. It's a given that style matters to a Thruxton buyer, but some may be specifically after a classic café racer look while others are flexible, and are just interested in a vintage-style machine with that new-bike smell (and reliability). Getting out of the city and watching as the buildings become trees. Photo by Brett Walling. For the former, there's the Moto Guzzi V7 Racer, which is getting an updated six-speed gearbox for 2016. Add in ABS, traction control, and a lower wet weight and it all helps to level the playing field, considering the Guzzi’s torquey little engine pounds the pavement with about 20 fewer ponies than the Triumph. While pricing on the new V7 Racer has yet to be released, the V7 Stone II is set at $8,990 MSRP. You can imagine the Racer will be more in line with Thruxton pricing, if not slightly more. Another loose competitor with classic café racer style is the Royal Enfield Continental GT. I emphasize the word “loose.” The GT has the look down pat and at $5,999 MSRP it offers considerable savings over the Thruxton. However, its big 535 cc thumper doesn’t even put out 30 horsepower. While the Thruxton’s 69 ponies are nothing to brag about at the drag strip, they’ll stomp all over the Continental GT. In addition, Royal Enfield’s dealer network is spotty at best. Riders who are more flexible and just want vintage style in a modern bike have more to choose from. It could be argued that the Thruxton’s largest competition comes from within Triumph’s own lineup, in the form of the Bonneville, T-100, and Scrambler. These bikes share the same drivetrain (the Scrambler spins a 270-degree crank while the T-100, Bonneville, and Thruxton are running a 360-degree crank) and retro-inspired styling. The Thruxton sets itself apart from the crowd with its rear seat cowl, rearset pegs, and racer stance. It also sets itself apart by being the most expensive of the group: The base Bonneville comes in at $8,099 MSRP, a significant $1,700 less than the Thruxton for a similar bike. While the logo has had slight changes over the years, the overall spirit remains the same. Photo by Ryan Schultz. Everyone (including our own Sean MacDonald) has been gushing over the new Ducati Scrambler and it could be conceived as competition for the Thruxton. The Ducati does not have the classic café racer look, but like the Thruxton, it exudes style. The Ducati also makes more power, costs less and weighs a lot less than the Thruxton. The Ducati that was more direct competition for the Thruxton was the short-lived Sport 1000. Discontinued in 2010, Ducati could barely give these bikes away at the time, but now they have become rare and expensive. The Thruxton offers style straight out of the box that will have you thinking twice about buying that leaky Honda CB550 with wiring issues you found on Craigslist. It is a backroad burner with a pedigree harking back to the beginning of the café racer renaissance. If you are looking for a modern, lightweight, nimble performer, there are better bikes out there. However, that’s not what the Thruxton is about. It is aimed at people looking for a capable bike that stands out from the crowd and proudly beats its own drum. If that sounds like you, Triumph has you covered. The Thruxton does a good job of capturing that outlaw vibe. Photo by Brett Walling. The Thruxton is forgiving enough for relatively new riders to enjoy it and grow with it, while competent enough to please veterans who love its unique style and are satisfied with its level of performance. It has the ability to grow with you, allowing you to make modifications and alterations to suit your ability, riding style, and aesthetic sensibilities. It’s perfect for riders looking for a blank slate to customize. Half the fun of owning this bike is making it your own. While we know they’re not good for us, there is an unmistakable cool factor associated with running around town with the bad girl (or boy). The Thruxton elicits the same sentiment of being a badass with less of a chance of landing you in jail. Just in case, you should probably start setting aside a few dollars for bail.